CESE is pleased to announce that our keynote speaker for this year's Annual Meeting (to be held on Saturday, June 29th, 1:00-4:30 in Albuquerque, New Mexico) will be none other than Louisiana activist Zack Kopplin. Kopplin has led a vigorous opposition to that state's anti-science legislation, the so-called "Louisiana Science Education Act." 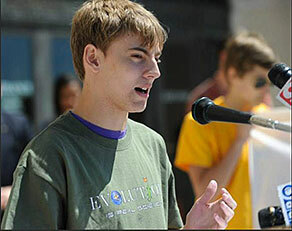 Read Zack's March 22nd 2013 op-ed in the Guardian (UK) here. Stay tuned to the CESE website for details of the annual meeting are finalized; click here for descriptions of previous annual meetings. 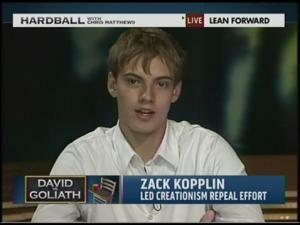 Also, read some of Zack's work at the "Creeping Creationist Vouchers" website. It's the Spring Break 2013 Climate Change Speaking Tour! 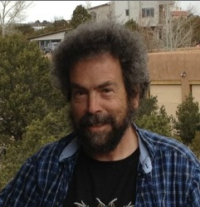 It's Spring Break at New Mexico Tech, and CESE webmaster Dave Thomas is taking a road trip to give a series of talks on the topics of science, pseudoscience, climate change and global warming denial. Here is the schedule. There is a small fee for the Lifelong Learning classes. The first of these two lectures will examine what makes science unique among human endeavors. While political, religious and legal arguments all involve making one's case by cherry-picking facts,science proceeds by cherry- picking those hypotheses that best explain all facts. We will consider the role of scientific consensus and peer review, Cargo Cult science, cognitive illusions and more. At the second meeting, we will consider how these concepts apply to climate change and global warming. Why is carbon dioxide more worrisome than other greenhouse gases? How can we tell man-made warming from natural climate change? Has the "Climategate" scandal really disproved global warming? Has science found human-caused global warming to be real, or do we need more data? Dave Thomas on "Climate Change: Just Nature, or are Humans the Problem?" The AWMA March meeting will be in the Banquet Room at the Golden Corral Buffet and Grill, (10415 Central Avenue NE, northeast corner at Eubank) in Albuquerque on Tuesday, March 12, 2013, from 11:30 a.m. to 1:00 p.m. Dave, a New Mexico physicist and teacher, will talk about how can we tell man-made warming from natural climate change, why carbon dioxide is more worrisome than other greenhouse gases, whether the "Climategate" scandal really disproved global warming, if more data are still needed to decide, and more.